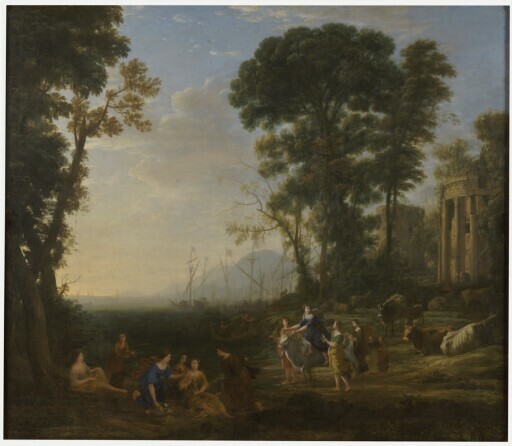 Claude Lorrain, the greatest artist of the classical school of European landscape painting, raised this previously secondary genre to a new level of sophistication and prestige. Characterized by the balanced arrangement of ideal landscape motifs and classical ruins, his works often introduce complementary mythological or pastoral elements that evoke a timeless, poetic world. Claude left his native Lorraine as a young man and settled in Rome, where he remained for the rest of his career. This majestic and important work, painted for the French ambassador to Rome, Charles de Créquy, helped to establish him as the city’s most successful landscape painter. The story is from Ovid’s Metamorphoses. Jupiter has taken the form of a divinely beautiful snow-white bull and in this guise enticed the princess Europa onto his back. He edges toward the water, across which lies the isle of Crete, to which he will abduct her. Claude includes a ruin inspired by the ancient temple at Tivoli, which he had studied during frequent excursions to the Roman countryside. The enchanting atmosphere of the landscape depends on carefully modulated effects of light. Painted for Charles de Blanchefort, maréchal de Créquy and duc de Lesdiguières, [1573-1638], France. by inheritance to his grandson, Charles Ronald George Nall-Cain, 3rd baron Brocket [b. 1952], Brocket Hall, Hertfordshire, England until 1974.